Al and me at Spring Training last year. I need to wear this shirt more often. 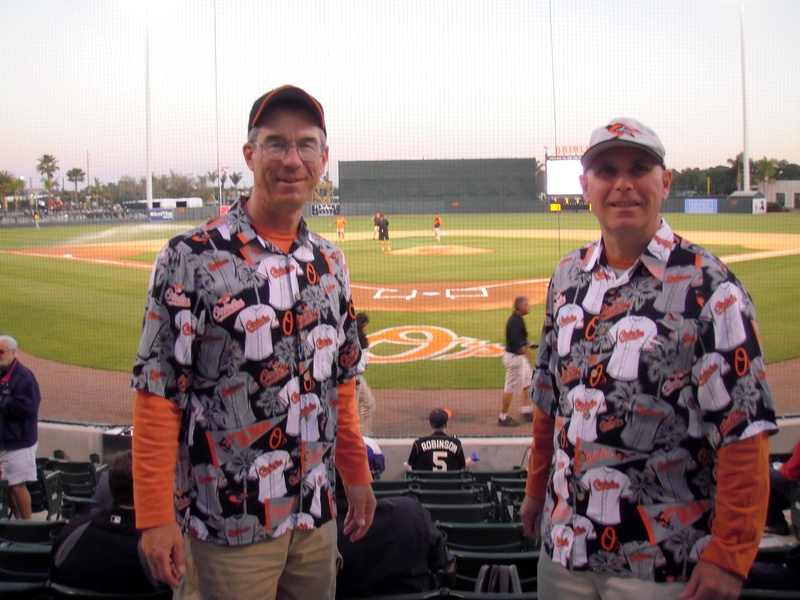 As many of you know, Al Smith and I ventured to Florida for two weeks last year to take in Spring Training. Al enjoyed Florida so much that he and his wife Margo bought a house at The Villages and moved there! Needless to say, they’re getting company the first week of March as Martha and I will fly down for a visit. Naturally, we will be taking in a couple of games which at the moment include Orioles v Toronto at Sarasota, the University of Florida v the University of Indiana at Gainesville, and Astros v Phillies at Kissimmee. Mostly, we’ll be walking around wearing shorts just to enjoy walking around wearing shorts. Hi Larry! I’ve been at a fog-out game and it’s amazing how fast it can roll in. It is great to have friends in many places. One of these days I’m going to travel through Georgia and look up a couple of friends whom I haven’t met in person yet! That will be a great way to spend your ??? birthday! I know how old you will be but I’ll keep that between us! Hey, that’s what friends are for! Have a great time, and give us your scouting report while you are there. I think Toronto will be the team to watch out for this year instead of New York. Don, I will bring back a full report and I agree with your AL East assessment. I look for the Yankees to fade badly around August 1st. Yes, yes we are, Bonnie.